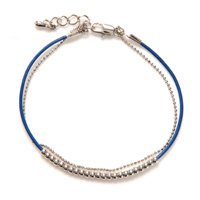 Delicate bracelet composed of a thin leather piece with metallic beads and a thin metal chain. Charms slide right on just like our regular chain. Silver tone metal with assorted leather colors - choose the stone color that corresponds with the leather color you'd like 7" with 2" extender.